Database Systems Corp. (DSC) offers automatic phone answering systems and platforms for small to large organizations. Our business phone systems include our PACER and WIZARD call center solutions with IVR features and capability. An Interactive Voice Response (IVR) processes inbound phone calls, plays recorded messages including information extracted from databases and the internet, and potentially routes calls to either in-house service agents or transfers the caller to an outside extension. This IVR software acts as an automatic 800 phone answering system that collects useful information from a caller before the call is processed or transferred to an agent. Our IVR Phone Answering Software could fulfill the caller’s request without a transfer. Our business phone system gives your organization a 24 by 7 capability, providing around-the-clock information to your callers. By responding to prompts provided by our IVR system, callers can now receive any information you choose to make available. Call centers in particular can become instantly more productive by letting the phone system gather caller information, verify caller identity, and if necessary determine the best service representative to handle this request using our interactive voice response technology. Contact DSC to learn more about our phone answering systems. Sara Lee Corporation is a global manufacturer and marketer of high-quality, brand-name products for consumers throughout the world. With headquarters in Chicago, Sara Lee Corporation has operations in 55 countries and markets branded products in nearly 200 nations. Sara Lee Corporation's leading brand names are household words around the globe. Sara Lee's preeminent brands are built on consumer needs and expectations, offering exceptional quality and value. Sara Lee acquired an automatic phone answering system from Database Systems Corp. to process after-hour orders for it's clothing and apparel line of products. Using simple voice prompts, this system allows consumers to place orders for these clothing products without the need for a sales representative. Orders are processed the following business day. DSC can provide a complete, turnkey phone answering system for your call center. 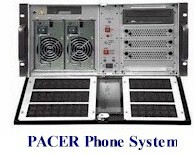 These modern PC based phone systems include a Windows PC with telecommunication boards from Intel / Dialogic. When combined with our Answering Service Software, these call answering systems can perform both inbound call distribution as well as outbound predictive dialing and voice broadcasting campaigns. Our WIZARD phone system is an entry level call center system that supports from 1 to 48 analog phone lines. If your call center requires more lines, our PACER phone system can be used to process phone calls using hundreds of digital phone lines. Contact DSC to learn more about our phone answering systems and services.